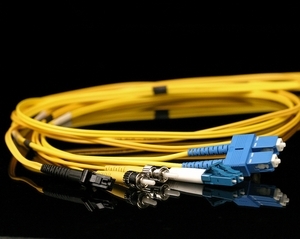 Singlemode fiber optic patch cables are called 9/125. This indicates the glass core is nine microns in diameter. The “125” is the size of the core plus the cladding (125 microns). Actually you may see singlemode fiber specified as 8.5/125 or anything between 8/125 and 10.5/125. These are all equivalent. The PVC jacket of the singlemode cable is normally yellow (although we can make them in other colors). The outer diameter of one fiber is 3.0mm for ST, SC, and FC connectors, but 2.0mm if the cable has an LC or MTRJ connector. We can also make these cables with a plenum jacket or a LSZH jacket, if required. The cables below are 9/125 glass and are classified as OS2 fiber. The bandwidth in singlemode fiber is actually almost infinity. The typical attenuation is 0.40 dB/km at 1310nm and 0.30 dB/km at 1550nm. At gigabit speeds, the signal can normally travel up to 25km on this fiber (at 1310nm) and up to 80km at 1550nm. At ten gigabit speeds the distance is a minimum of 5-10km at 1310nm and 30-40km at 1550nm. Of course, you wouldn’t use patch cables to go these distances. We can provide the longer cables in indoor/outdoor, aerial or burial, custom configurations. These are duplex cables (two fibers and two connectors at each end).